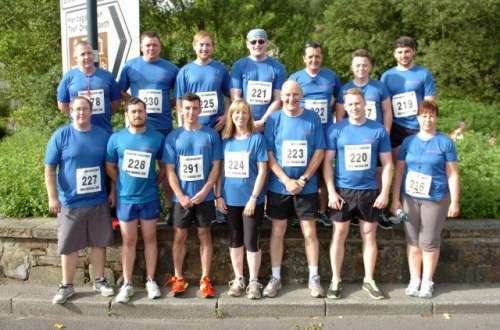 Fourteen staff from Water Treatment Products put on their trainers and company t-shirts, to take part in the ‘Mic Morris 10k Race’ to run from Blaenavon to Pontypool on Sunday 20th July. First across the line was 22-year-old Lewis Jones, a Bristol University Graduate working over the summer at the Company in a superb time of 37 minutes and 44 seconds. Relative of Mick Morris who works at the Company, Aron Ireland also took part in the race, raising money for the Mic Morris Trust. “There was a superb atmosphere and the weather was really good.” he said. Keen runner Tim Carter, Director, also took part in the race and said the enthusiasm and atmosphere from onlookers and all our staff was great. Tim plans to run the race next year.